Topics: Securing Of Food, Water, Rearing Of Their Young, Benefits Of Backyard Birds, Bird Feeders, and Wild Bird Seed. The estimated 173 daily visitors, each view 1.90 pages on average. Its 2 nameservers are ns1.sitesell.com, and ns2.sitesell.com. 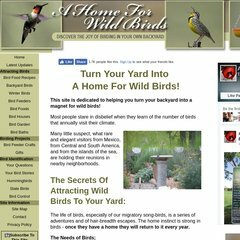 A-home-for-wild-birds.com's server IP number is 66.43.56.47. It is hosted by Sitesell Inc (Quebec, Montreal,) using Apache web server.